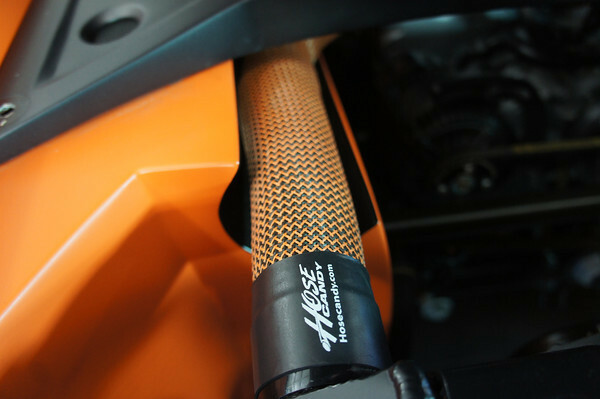 *The 5/8" (ID) Heater Hose Kits use the 15/16" to 1-1/16" Boa Clamps. The 3/4" (ID) Heater Hose Kits use the 1-1/16" to 1-3/16" Boa Clamps. To order additional/replacement clamps, please visit our Boa Clamps By Size page to select the correct size of clamps needed. Protects to 1200 Deg F.
Dragon Skin™ is an extremely high temperature resistant Skin commonly used as thermal protection for hoses that are subjected to continuous and extreme temperature environments, such as engine manifolds and exhaust systems. Dragon Skin is braided from fiberglass yarns and saturated with high temperature resins. Dragon Skin is tough and durable, maintaining its tight structure under extreme vibration, abrasion, mechanical stress and temperature variations. Dragon Skin is available in a wide range of diameters. It installs easily over a variety of applications to either deflect or retain heat in environments up to 1,200°F. Note: Due to the strength and construction of Dragon Skin, sizes above 1” will have difficulty in forming a tight bend greater than 60 deg. Bends greater than 60 deg will have creasing in the bend radius. Carbon Fiber and Kevlar will tightly form bends in excess of 90 deg.